Exploring the very best of Tumblr blogs and posts is about discovery. Tumblr is a blogging platform that has grown in popularity since 2006 to rival any popular social network around these days. Do you have a page there ? What do you know about this social network ? Maybe you're someone that knows about it, but hasn't had any reason to take an invested interest in it. Without question, there are many absolutely wonderful blogs to discover on Tumblr. Additionally, as a blogger or a website owner, you can use this network as a road back to your own main website or you can set up shop on Tumblr as a way to grow brand recognition for your own content too. However, before getting into the discovery, lets highlight some realities about the social platform that you may not have been aware of. When compared to Blogger or a blogging medium like Wordpress, Tumblr is easier to use than either of the other two and you can start posting your content in just a few minutes or less. This platform is highly visual based so it's great for anyone that utilizes photos, however for those that do not, posting photos that relate to your content on the Tumblr platform is still a very effective way to get all the benefits of using the network as well. So with that said, exploring the best of Tumblr is not something I can cover in just one post, but for the sake of this blog post, I'm going to delve into a couple different categories.. that being the following: Business and Marketing. Focuses on brand identity through imagery. This is certainly a place to go to get visual ideas for your brand. There are pages and pages of images associated with business brands. There are several wonderful nuggets of information that can change the way you think and approach your particular business and business in general with respect to what you blog about or what the central focus of your website is about too. It's dubbed as a place for entrepreneurs and those in business.. once again if you're a blogger or a website owner, this is a good resource for motivating thoughts, information and inspiration as stated in their message to visitors of the Mega Business Tumblr blog. This is a blog where information has been curated from different places online and posted for anyone that comes across their page(s). This is a blog that focuses on data and big business. Amongst the posts, there are statistics and other business news that affects the everyday small business owner. This blog is about the life behind the scenes of Rupert Murdoch, a man that understands business in the 21st century. Another absolutely wonderful blog, that shares a wealth of knowledge that is true to it's name.. "ad teachings". Complimented by the posts respective visuals you'll find some pretty insightful posts on this Tumblr blog. As the name implies, the posts are about being creative and the impact of creativity as well. In one post, I read.. it said that being wrong was right for creativity and that.. "A man's errors are his portals of discovery." - James Joyce. Whether you're blogging or developing your own website, this couldn't be any more true in that statement by Mr. Joyce. One of the major staples in the marketing conversation, Marketing Land covers quite a host of topics in online marketing that are beneficial to anyone with a blog or website. As I've mentioned as well on the topic of grammar.. such a common thing that we all have to do can have drastic adverse effects in content marketing and on any website so it needs to be given the proper attention. With that said, in one of their posts, they ask the question about poor grammar killing your efforts in content marketing. Something so simple, yet something that we all must do everyday as we speak and write can certainly leave a bad taste in the mouths of visiting or recurring readers. This is a blog with several goodies to explore when it comes down to marketing tips. From the blogs overall design to the content presented that you have to explore, there's a lot to learn. Too many of us get into blogs and websites and business without truly understanding the in's and out's of marketing and this website provides helpful insight in that conversation. This blog explores different aspects of online marketing and marketing in general. 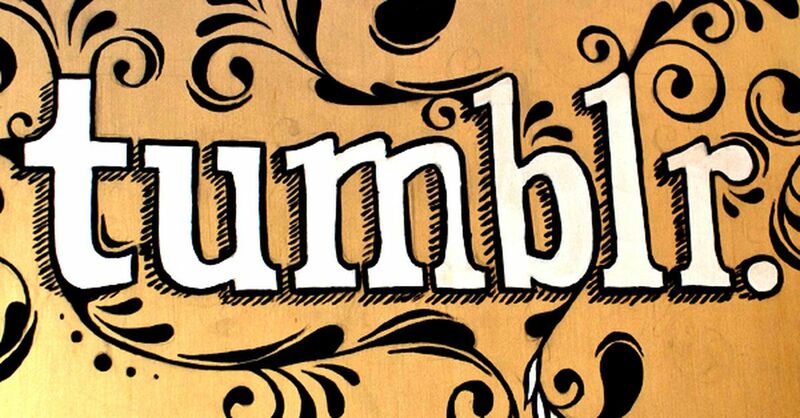 From social media, viral content, design to inbound and outbound marketing, this Tumblr blog has it covered. This is dubbed as the official feed from the sales and brand strategy team from Tumblr complete with weekly round ups as well. Another absolutely wonderful blog on online marketing that covers an array of topics from advertising, ecommerce, utilizing social media in conjunction with your brand, marketing both domestically and internationally, reputation management and content marketing. While there's there more to discover on this blog, it's one of the gems on Tumblr that have proven to be beneficial to bloggers, website and small business owners. While this blog isn't most frequently updated blog on this list, the marketing information that currently exists is valuable and provides insightful perspective that is useful which is why it deserves mention here. Now I assure you that there are more blogs on Tumblr that are worthy of being added to a list of popular blogs that fall into either of these categories stated in this post or some other category (keep it family friendly please) on their platform so if you comment and are aware of one, then by all means please mention it so that I may add it to another post on Tumblr that I can create in the future.